This is one of those salads I could eat every day for months. All local from the farmers' market. 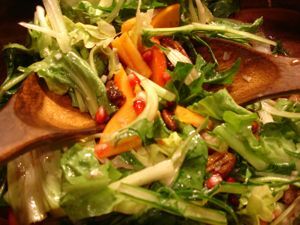 Annabelle's puntarelle and escarole, Blossom Bluff persimmons, Art Davis' pecans (spiced with a little brown sugar, cayenne and other spices), and Somebody's pomegranates but I don't remember whose. It's bitter and sweet and crunchy and spicy and refreshing and it's just a great salad. I usually make a lighter vinaigrette with shallots (no garlic) and lemon juice or Champagne vinegar. Nishanga and I will be teaching a FREE soup class this Friday at The Cog. Join CoG members and cooking teachers Vanessa Barrington and Nishanga Bliss in an exploration of the many ways of making economical, nourishing, delicious soups. Veggie stocks and bone broths, the wonders of miso, cream soups and bean soups, soups and fermentation, recipes, and much much more! Bring a mug and spoon for tasting. FREE! If you're not a member come and learn from Susan Fleming how The Cog can save you money. 7pm at The Cog 67th and Hollis in Emeryville. This entry was posted in classes, community, from the market, healthy, hearty. Bookmark the permalink. Post a comment or leave a trackback: Trackback URL.